We declare that, God, The Almighty, is Lord over NIGERIA!! 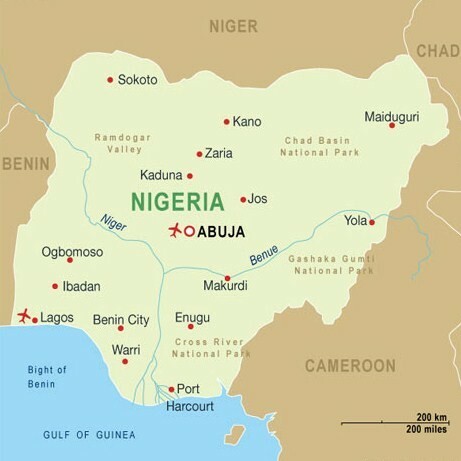 The Federal Republic of Nigeria is a country in West Africa on the Gulf of Guinea. It hasa diverse topography, with arid savanna, rainforest, mountains, mangrove swamps, and the wide delta of the Niger River. Nigeria became independent from Britain in 1960 and is now divided into 30 states to accelerate development and to minimize the impact of ethnic loyalties on national politics.Ethnicityis a sensitive issue, as Nigeria has 426 ethnic groups. The economy is oil driven a wealthy nation but mismanagement abounds leading to abject poverty. God is about to change all this! In Jesus Mighty Name, Amen. God will remove every Ahab that is in authority. Every ungodly rulers and those that do not stand up for righteousness and integrity. That the doors will open into every home that does not know the Lord for the penetration of the Gospel. Pray for peace. Ask the Almighty God to comfort, heal and provide for those who have lost loved ones and /or properties and businesses during the religious and tribal violence. Pray against all hidden agendas, and that any attempts to deliberately orchestrate violence between the religious communities of Nigeria would come to nothing. Pray that every evil counsel that is in existence be destroyed. (Job 5:12-14). A destruction of all false alters and speak an establishment of the Alter of the Almighty God, in Jesus Mighty Name, Amen. A blessing over the Land. From the east to the west, from the north to the south proclaim a blessing. A destruction to every prince of the air ruling over that region in Jesus Mighty Name, Amen. That the True Light will shine to all that are still in darkness in that region in Jesus Mighty Name, Amen. Remember to cover yourself, your family, your loved ones, your ministry, and your work, with the blood of Jesus. Ask God to be your rear-guard as you battle in intercession. Also pray for all other Believers that are praying for the different nations and ask God to strengthen them and grant them success.